Friday. PCBs and components have arrived. 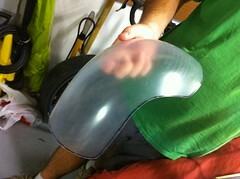 We've started the print job for the right half of the helmet, which should finish late Saturday evening. I got the PCB parts from Danny and began soldering the components on. Just trying to get the first LED to blink is turning out to be difficult. 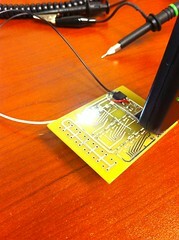 Because we used the ExpressPCB el-cheapo Miniboard service, there are no silkscreens or solder masks. Knowing where each component goes would have been nice, since Alex designed the boards and I'm doing the assembly. But I'll just have to figure it out. Saturday afternoon. Danny leaves for D*C in 5 days. 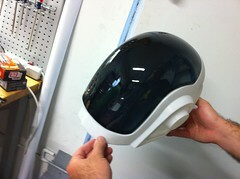 We test fitted one of the plastic light frames in the left helmet half. The printer is still printing the other helmet half. Alex has put about 6 or 7 coats of primer, spray paint, and wax on the MDF mold. It has the finish of a bowling ball. We wanted the finish to be perfect because we heard the plastic will pick up even the smallest of textures. 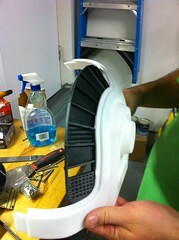 The vacuum former is complete with a hole in the side that is a perfect fit for the shop vac hose. 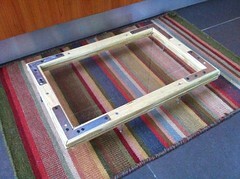 We cut our first piece of plastic to shape and mounted it between two frames of wood. The plastic is clear PETG from McMaster. With the mold looking so great, our expectations were set for success on our first try. Boy were we wrong. Our first mistake was trying it without the plastic being melted enough. 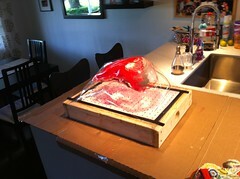 Then the paint on the mold did not take the heat well and completely fused to the plastic. The resulting piece photographed below came from a lot of prying, cutting, and re-heating to get the mold out of the melted plastic. Notice the red paint all over the plastic. FAIL. Success! We were all amazed at how incredibly well it worked this time. 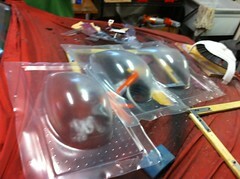 We sketched the sharpie line on the formed plastic and with a little prying the mold came out. Using some shears we cut the piece to the rough shape. 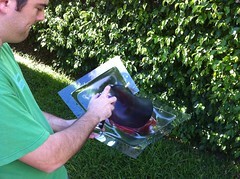 Using the first bad mold as a tray, Alex hit the inside of the good part with some spray tint from the auto parts store. 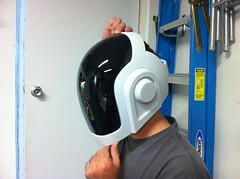 A few minutes later we test fitted it on the helmet half. And to wrap things up, we honed our vacuum forming skills making a few more copies as backups in case the tinting or trimming was difficult. At this point, things are turning out WAY better than we had hoped. 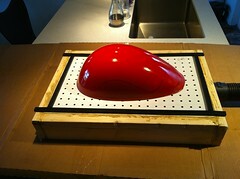 Our first vacuum forming experience ever turned out to be an amazing success! Saturday Evening. Checking up on the printer, it looks like the right side is almost done. Check out the video to see how the printer can print some overhangs without any support underneath if the angle is right. While that finished up, I tried to figure out why the PCBs weren't working properly. It turned out that while rushing to finish the design, we completely overlooked the fact that the darlington transistor arrays we chose to power the LEDs are N-channel, meaning they sink current. We had them hooked up as if they were sourcing current. Essentially that meant both leads of each LED were connected to ground, so nothing was going to light up. With some "slight" modifications to the PCB, I was able to cut some bad traces with an exacto knife and solder wires to the right locations. Voila, we have light! I wrote up a quick test pattern to make sure the shift registers were working. We tested the LEDs under the plastic frames. Danny has the colored material at his house, but a paper towel will suffice for now. At 2AM, that pretty much concludes our Saturday night. 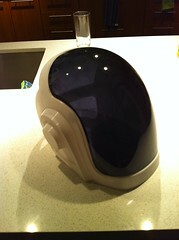 And even though the right side of the helmet looks exactly like the left side, it is so pretty I have to post it. But wait, there is more progress! Click here to see Part 3. I just saw Volpin's blog a day or two ago, good luck with your project. I would be willing to give it a try, as the plastic side of things I have down np, but the electrical part is the challenge for me. This is awesome! Mark, why didn't you tell me about this? Wow, would you make copies of this helmet to sell? What right price would that be...? good effort. 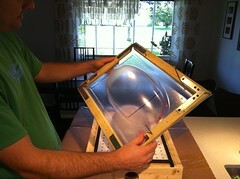 whats the thickness of the plastic wind-shield ? and what did you use to heat it ? 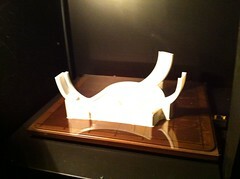 I am trying to do something similar with a plastic mould but unable to heat up plastic uniformally. Where can I buy it http://www.flickr.com/photos/36385785@N05/4937214724/ ?